I’ve just uploaded, for the fourth time, a research grant application to the National Institutes of Health (NIH), and it appears that this time it has managed to get through the many layers of checks, and so now has been accepted by the Electron Gods. Like most grant applications, this was a team effort. There were two principal writers and a number of additional contributors. Each collaborator needed to submit a “biosketch”, which in NIH-ease is a highly stylized resume as well as a letter of support stating their affiliated institution or company, the scope of the services they would provide, and agreement to our payment arrangements. For the first time, I managed this entire process using my Mac and the Pages word-processor, without having to default back to a Windows machine using Office Word. The only awkwardness, which, in hindsight might have been avoided, was extracting the list of footnotes and citations so that the body of the research plan which has all the footnotes, could be saved as a single Adobe .PDF document, while the actual citations were saved in a separate .PDF. If contributors didn’t have a Mac, then I asked them to submit information as Word documents, using Arial 11 point body text on pages with .5 inch margins. These opened up fine within Pages, and could then be modified and then “printed” to an Adobe .PDF. We used BaseCamp as our project manager. Over the course of about six weeks, we posted over 100 individual files, in various formats. I used the BaseCamp tasklist most of all, along with the milestones. 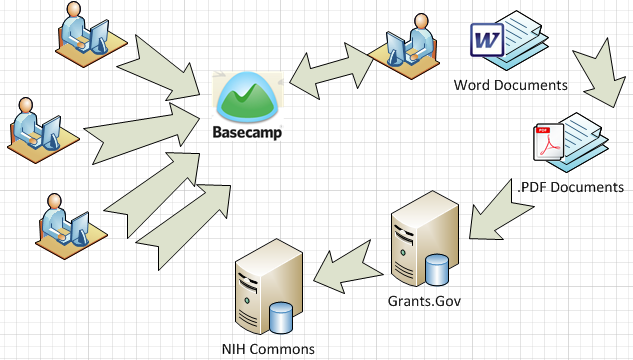 In the best of all possible worlds, all the writers would submit documents through BaseCamp. In practice they would usually eMail Word attachments directly to me. I would convert these to .PDF files and post those on BaseCamp for everyone else to look at. Once they were in finished form, I kept final .PDFs these in a series of folders on my iDisk, which provided a safe repository and access from my computers in the office and at home. This entry was posted in Uncategorized on December 4, 2010 by lkeyes70.